Experience this beautiful country for yourself. Here at Cruise 1st we offer an incredible mix of dazzling cities, pristine beaches, breathtaking scenery and acres of lush greenery in Australia and New Zealand. Cruising this region is an unforgettable experience and what's more, we can offer an itinerary as unique as you for a price you simply won't find anywhere else. We have our very own office in Sydney which allows us to source the best-value Australasian cruises backed up with an amazing service. Extend Your Stay In Sydney 4* Central Hotel From £79pppn , Includes a FREE Sydney Opera House Tour , Includes 2 Night Sydney Stay! 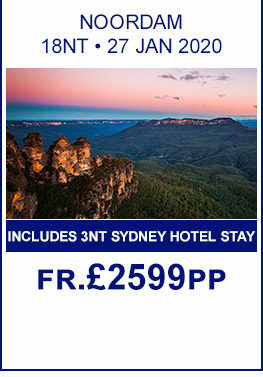 Includes 2nts Sydney stay! , Free Upgrade from Oceanview to Balcony Stateroom! 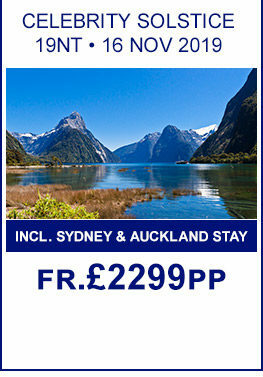 , Includes 2nt Stay in Auckland , Includes FREE Sydney City Tour with Bondi Beach! , FREE Drinks, Gratuities & upto $300 OBC on Oceanview and above! , £0pp Deposit! 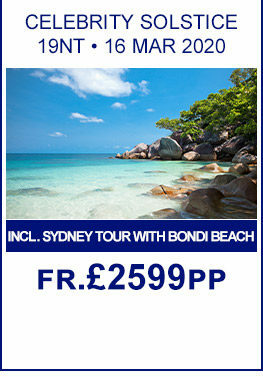 Includes 2nt Hotel Stay in Sydney! Whether you are looking to fly over and board your cruise in Australia, or plan on cruising to Australia on a repositioning cruise or world sector, we have great deals available. Plus, why not think about adding a land experience? After all, you've come a long way so why not have a look around? From the Vineyards & Gourmet Food Trails of Sydney and New South Wales to Uluru (Ayers Rock) and beyond, a world of discovery awaits! Try the Indian Pacific train journey from Sydney to Perth, or venture to the Great Barrier Reef and dive in, take in the Tropical North or visit cosmopolitan Melbourne; there is something for everyone in this wonderful location! 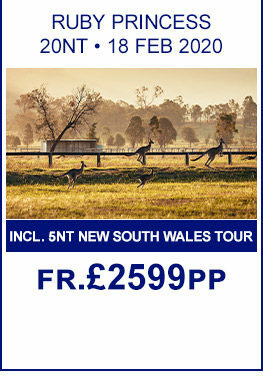 Why not add one of our exclusive land tours while in Australia?